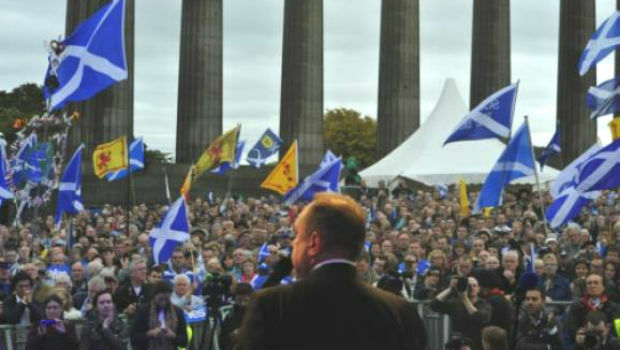 The annual Scottish independence march and rally yesterday in Edinburgh was attended by around 30,000 people, a threefold increase on the previous year. It was a real family day out with lots of colour and a vibrant atmosphere as people of all ages and from all walks of life united at Calton Hill to listen to speeches from people who were from many different political parties and from none. This was an impressive and positive event with speeches painting visions of a Scotland with a brighter future as an independent country. There were people there with tears in their eye as Nicola Sturgeon and Elaine C. Smith in particular explained their reasons and motivations for wanting a Yes vote in next year’s referendum. The sheer number of people who mustered for this rally should worry those on the No side of the debate. If the Yes side can persuade this magnitude of activists or more to talk to people on doorsteps around the country, this may well translate into poll success. The No camp appear to believe they have the referendum won already but this march and rally was a clear statement of intent by Yes Scotland and the message from today is that it is well and truly game on and all to play for ahead of the vote next year. Allan Bissett, poet and playwright. Many people attending expressed disappointment to the roving Fife News Online reporter about the lack of media coverage, from the BBC in particular and we can only agree with that assessment. For the BBC to barely cover a march and rally of this size, on an issue of this importance, held in Scotland’s capital city is unpardonable.